Several times a year, Green Light is the grateful recipient of the volunteer efforts of Americorps NCCC teams. NCCC is a government run program for 18-24 year olds that want to dedicate 10 months to community service. Corps members are placed in teams of 10, who spend 6-8 weeks at different sites around the country, working to “get things done for America”. Cassie Thomason is 23 years old and recently graduated from University of Kentucky. She was born and raised in Henderson, Kentucky and has never considered any other place “home.” After graduating from college she wanted to create a stronger impact on the world. In mid-October she joined AmeriCorps NCCC and over the past year she has worked in Sacramento, California, Los Angeles California, Green River, Utah, Chalmette, Louisiana and finally New Orleans, Louisiana. She had never been to these places before, but after the two months she spent in each, she is able to consider all of them “home”. 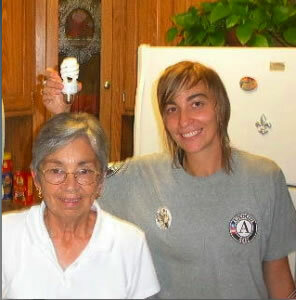 When asked about her experience in going into strangers’ homes and installing the CFL light bulbs, Cassie said, “they were all very welcoming.” In fact a lot of them offered her a cold beverage and something to eat. She mentioned that they were all very grateful for her help and were not afraid to show their excitement. One of her most memorable homes was a Vietnamese woman living in New Orleans East. She is a wife of a local fisherman who has lost work because of the oil spill. This woman was so happy that she was receiving some kind of help during these hard times that she made food and took pictures with the group. She also invited that whole group to come back to her house the following Thursday to eat a spaghetti lunch with her family. Green Light is thankful to all our NCCC volunteers who have contributed to our work over the last 3 years. Tens of thousands of light bulbs have been installed by these teams, significantly reducing New Orleans’ carbon footprint, and saving money for individuals throughout the city.